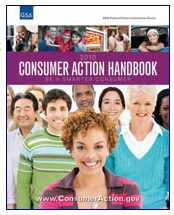 Get a Free copy of the 2010 Consumer Action Handbook. It is a free government publication that gives you advice on how to file consumer complaints, understanding credit, tips on buying a car or a home and much more. This is a great reference guide and good to have on hand. So make sure you grab a copy for yourself.